Since version 0.5.0 Openmolar1 can be configured to provide shortcuts to documents on the client computer (and consequently ships with fewer irrelevant/historical documents!). An example use for this is to store reference documents for certain clinical situations, of for billing information from health boards or insurance companies. However, users are encouraged to use this flexible feature as they see fit! 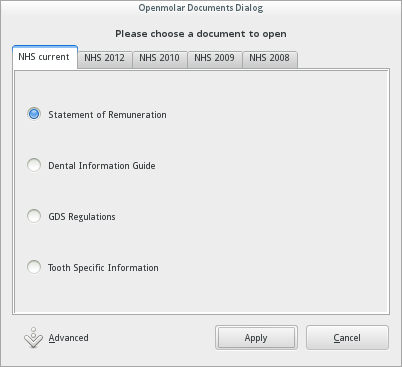 The simple way to use this is to place such documents in the hidden folder "~/.openmolar/documents" (or windows equivalent), and openmolar will offer these to the user when the document dialog is opened. A more complex configuration is to place a docs.xml file in this folder. Using this method the user is presented with a more human readable choice of files, ordered into tabs. an example of this file is shown below - and hopefully self-explanatory!